The latest event of the #Debate project has the theme “Active Citizenship and its Role in Sustainable Development.” From a wide range of issues in the field of sustainable development, environmental protection is more accessible to young people and more present in their concerns. We also take this opportunity to bring to the attention of the local community a less known thing, namely that at the Technological Highschool Azur Timisoara, the future specialists in the field of environmental protection are trained. The event is of the type of debate and will be broadcast live on the internet. Event Title: iDebate: The Young People and the Planet: What Can I Do to Save It? b) Can young people save the planet by promoting a reduction in consumption? 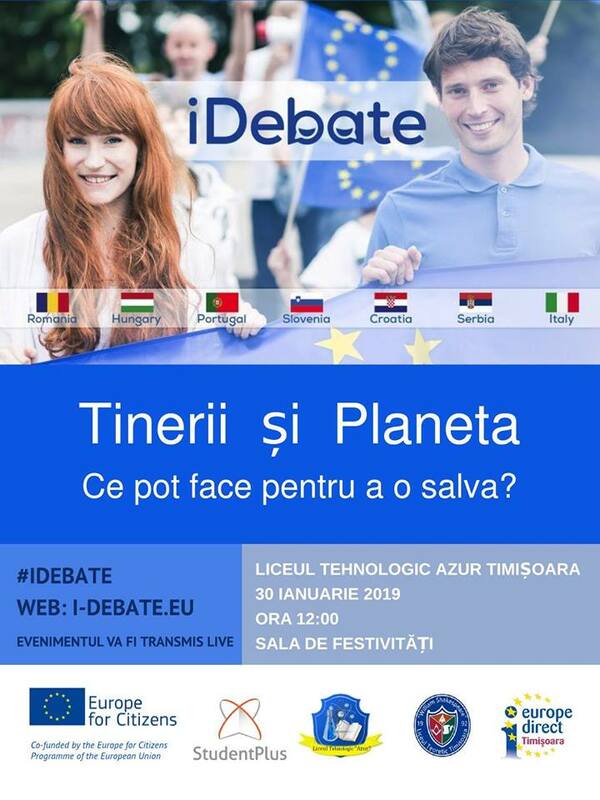 Between August 2017 and January 2019, the iDebate project hosted 35 local and international events, with over 2,400 young participants, and tens of thousands of Internet users had the opportunity to track them in real time on facebook pages, on youtube or on the dedicated page of the project. The events covered topics such as European solidarity, the functioning of European institutions and civic participation, the Euro-parliamentary elections in 2019, fake news and critical thinking, the digital citizen and, finally, sustainable development. But if the numbers talk about the efficiency of European project management and our ability to adapt to the intercultural working environment, the ease of working with partners from all European countries due to the political context, the technological advance and the improvement of the mobility at the level of the Union, we would like to remove which we believe, the project managers, is the bigger gain of this project. It refers to the restoration of trust between citizens across Europe, the reopening of intimate channels of communication between people who respect each other, who help and who, feeling more and more secure at home and in Europe, engage in fulfilling a dream. “The implementation of the iDebate project in Portugal was an outstanding experience and also an opportunity to bring together students from high schools and universities to debate the future of European citizenship, European institutions, democratic and electoral processes. The impact on public opinion faced some challenges and the activity of streaming was not always possible, mostly because of wifi constrains at schools. ” dr. Patricia Oliveira, national coordinator – Portugal, has been desiring to deepen in future projects. Europe for Citizens – One programme, 500 million voices!